The less security you have around the home, the more likely you are to become a victim of burglary. If you lose your door keys, you have to call out a locksmith. Experienced burglars, however, can often get in through locked doors. To put it another way, people who break into homes for a living know more about the security of a property than its occupants. They may spot certain vulnerabilities that the residents are not even aware of. Sometimes, all it takes to add extra layers of security to your doors is to upgrade the locks or add an additional lock and other basic elements. In this piece we’re going to place a particular focus on door cylinders, the heart of any secure door. Front door security is the first line of home defense. It refers to a range of tools and techniques used to strengthen doors against home invasions and housebreakers. #1 What Is a Door Cylinder? The keys to your doors have to go somewhere. In simple terms, a door cylinder is that part of the lock which accommodates the key. Most door cylinders are interchangeable. That just means you can usually swap them without having to actually alter the door lock. It’s the part of a door that can mean the difference between a break-in or not. #2 Why Use Different Door Cylinders? You may be reading here and wondering why we’re looking at door cylinders. After all, if all doors have them what else is there to know? Well, the problem with a lot of locking cylinders is that they use outdated technology. You can even find new doors fitted with bog standard locking cylinders, and burglars just love those. They offer little real protection for homes and are easy to tamper with for anyone who understands how they work. #3 How Do Door Cylinders Work? Despite their simple appearance, there’s actually some smart innovation going on inside the latest family of door cylinders. The cylinder runs along the exact central line of a mechanism. Although you don’t see it, there’s plenty going on when you unlock a door. 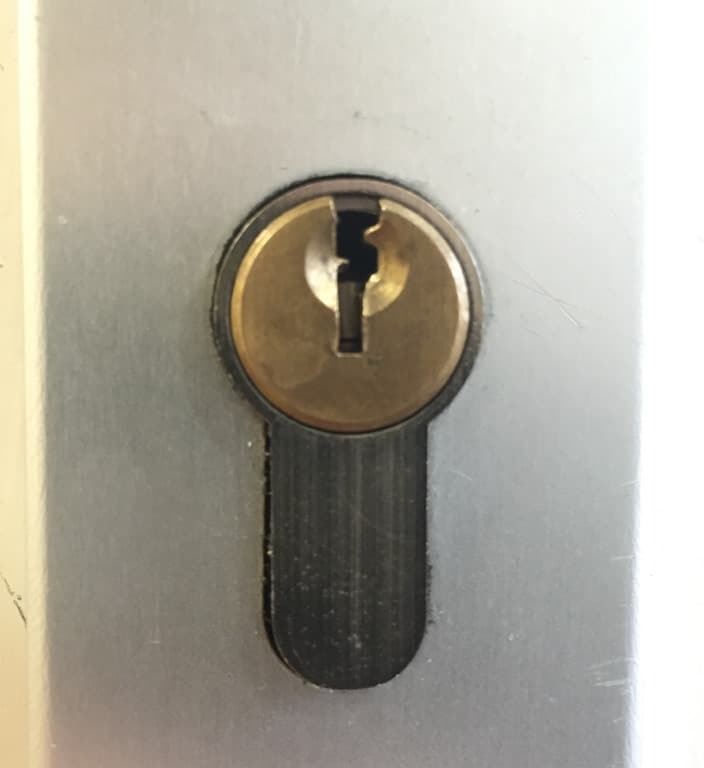 The mechanical parts inside the cylinder have to work in conjunction with the key for the lock to function effortlessly. The “tang” is one of these parts that sit inside the central area of a cylinder when the door is unlocked. When the door is in lock mode, the tang is both inside and outside the cylinder, keeping the door secure and locked tight. A door key triggers the mechanism that locks and releases the tang. As you turn the key to lock a door, you also turn the cylinder. When this happens, a strong spring forces the tang into its fastened position, thus securing the door. With some doors, on the inside, there’s a central button that you can press to lock it. It actually does the same job inside the cylinder as a key, but in much less time. Obviously you still need a key to open the locked door from the outside. There’s a bit more to a door cylinder than this, but these are its basic workings. An experienced burglar won’t have any problem breaking or picking the locks on doors with weak cylinders. A strong door cylinder, one that uses the newer technologies, will help to prevent people from breaking in. There are other layers of door security, but making sure you have tough door cylinders is a crucial first step. Every door requires a unique key to open it. However, if you opt for a tailor-made cylinder for use in all your doors, then it’s possible to open them all with a single key. #4 Where to Use Quality Door Cylinders? There’s something you need to know before rushing out to buy replacement door cylinders. The first thing you must do is identify the door type so that you invest in the right equipment. Some cylinders are standard size, but not all. If in doubt, speak to someone who knows about these things before you make a purchase. The cylinder has to be flush with other door furniture, specially the door’s exterior. If you have a garage that has a door inside which leads into the main house, consider that too. Even if your garage door is secure, still treat the door inside the garage as an entrance door. #5 When to Upgrade Your Door Cylinders? The answer to this question is to replace your door cylinders when the existing ones are inadequate. Some of you reading here will already have strong doors that include high-quality cylinder locks. If you’re unsure, get someone to check them for you first. After all, you don’t want to replace things just for the sake of it. Safety and security in the home is really important. The stronger your entrance doors are, the more protection you and your loved ones have against intruders. Along with doors, your windows also need strong protection, especially those on the ground floor. You can read about residential window security in our other articles. #6 Who Are Replacement Door Cylinders For? Anyone who lives in any kind of bricks and mortar structure, whether it’s in the city or out in the remote countryside. Entrance doors can never be too strong. Criminals are everywhere these days, and anyone at any time can become the victim of a break-in. Quite often, burglars target people who are more vulnerable as they’re easier to commit crimes against. This includes the elderly, single moms and more generally those living at home alone. We should all take door security seriously, but the above groups need to be especially vigilant.